It has been quite a while since an OEM has released a new wheel design that has made me sit up and take notice. I’ve long believed that it is the wheels that make the car, from a visual perspective, and many manufacturers have been phoning in wheel design. 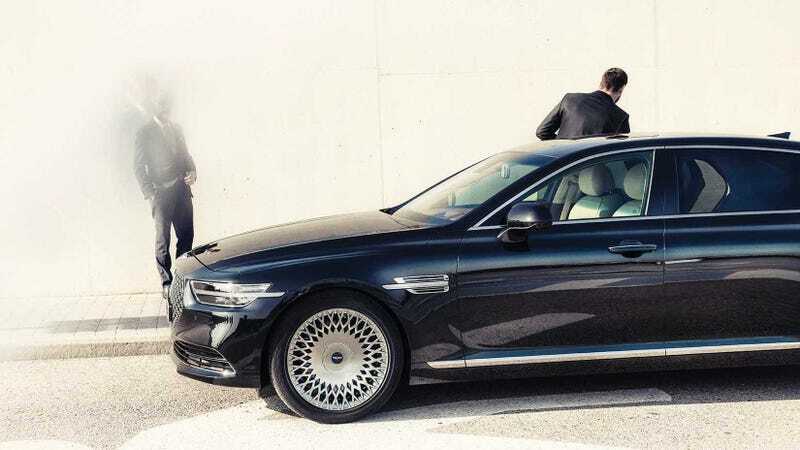 In the few hours since the G90 was first shown with these incredible wheels, some have mentioned the large-and-in-charge wheels you find on the current Maybach. For one thing, Genesis being mentioned in the same breath as Maybach only benefits Genesis. For another, Genesis have managed to make a better looking wheel. The turbine-style wheel on the Maybach is good, but not nearly quite so good as the interwoven spokes of the Korean. Genesis, in lobbing the Hail Mary new G90 luxury sedan at the LA Auto Show and hoping for a miracle, has paid serious attention to the wheels. They look amazing. They look like they belong on a proper grand sedan. They’re substantial and somehow remain elegant. It’s a tough balance to achieve. This is a modern take on the basket weave wheels that were once everywhere, which were themselves a then-modern take on the wire-spoke wheels that were once everywhere. The designer who penned these wheels, and the engineer that made them a reality, deserve a bit of applause. Large luxury sedans need a bold wheel choice to have the right look. Think back to the Monoblock wheels on Mercedes-AMG’s E55 of the late 90s and early 2000s. That was a wheel that looked exactly right for the car. While the new Genesis G90 has yet to be tested, this is a great first impression. Genesis wants to be taken seriously, and this wheel design is all business.